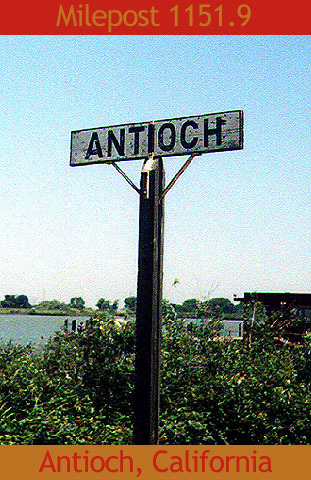 Antioch is rich in railroading history, and when you visit the historic Rivertown area of this growing Delta city it is not difficult to imagine the days when steam trains roamed the tracks that today still ramble along the banks of the San Joaquin River. Here you will find the only Amtrak station located between Stockton and Martinez, as well as fishing piers and promenades offering perfect locations for photos. If you have children, pack a picnic lunch and your favorite sporting gear and head for the Barbara Price Marina Park where benches and tables line a grassy knoll that provides a good view of the tracks. Don't forget the camcorder! The Pittsburg local heads west along the Antioch shoreline after collecting a load of boxcars from the yard at the Gaylord paper mill. The wall to the right of this picture offers a great vantage point if you are interested in seeing the tops of trains. Check out photo #8 below to see a photo taken from above. Photo by Roni Gehlke. 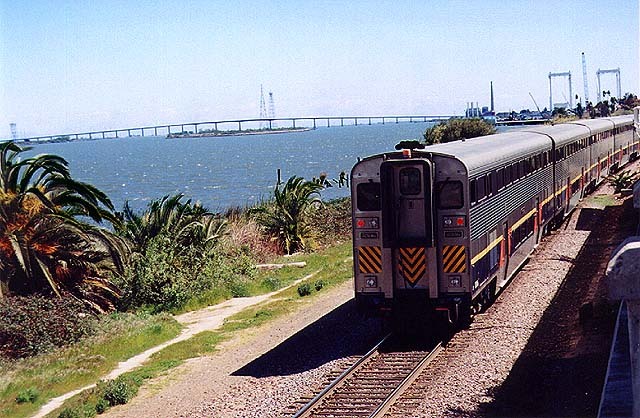 A pair of Santa Fe "Yellowbonnets" shove a string of boxcars across the causeway near the Antioch shoreline in early November 1998. The cars are bound for the yard at Sando for use by the Gaylord paper mill. Photo by Glenn Gehlke. The aging station sign near the Amtrak station platform adds some character to the shoreline that bears its name. That's the San Joaquin River peeking out from behind the bushes in the background. Photo by Roni Gehlke. 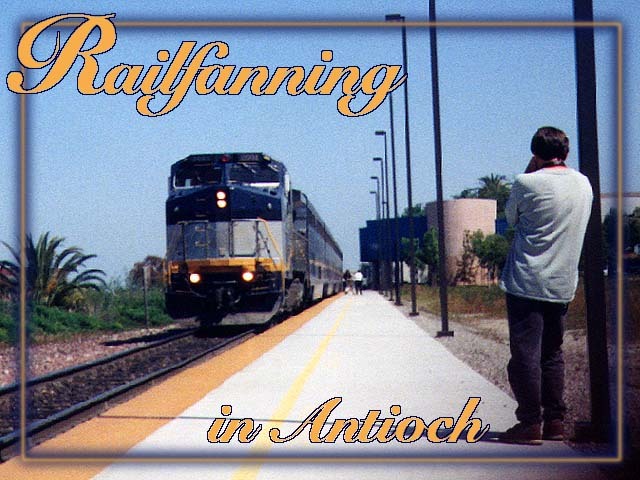 Amtrak's eastbound San Joaquin Train 716 makes a station stop in Antioch in January 1999. AMTK 2006 is bringing up the rear of this unusual consist, which features locomotives at either end. AMTK 2004 is on the point, out of view in this photo due to the train's length and a difficult angle. Photo by Roni Gehlke. The headlights of AMTK 2004 pierce the haze just after sunset as Train 715 takes on passengers at the Antioch station. 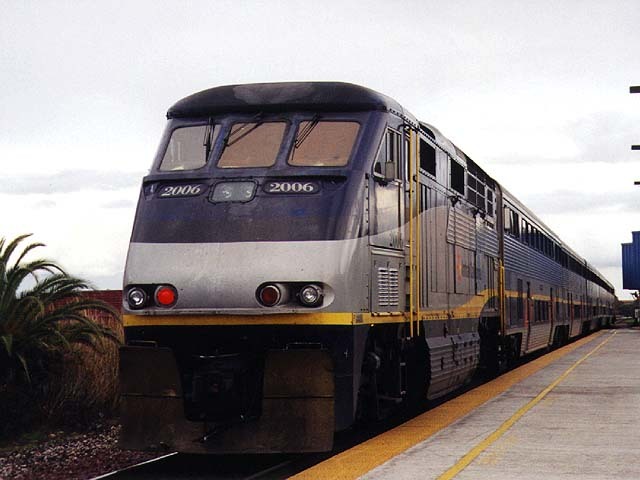 It is early January 1999 and the lead unit has just returned from a two-month stint at Redondo Junction in southern California where it underwent repairs for damage sustained in a collision with a truck in Bay Point. As is the typical pattern for this time of year along the Delta, in a few hours this location will be shrouded in dense tule fog. Photo by Glenn Gehlke. 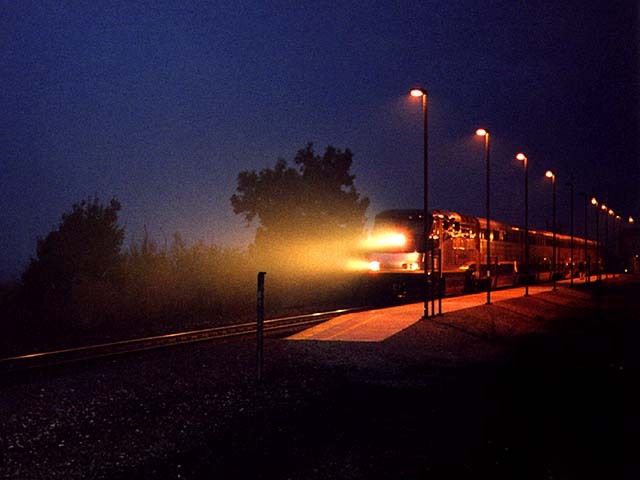 The Union Pacific Steel Train returns from Pittsburg on a blistering afternoon in August 1998. 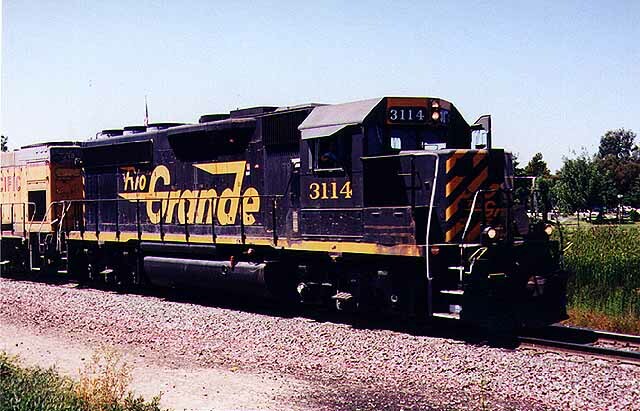 We baked in the 100-plus degree sun for half an hour just to get a look at this Denver & Rio Grande Western, a GP40-2. Barbara Price Park and the Antioch Marina are barely visible in the distance. Photo by Roni Gehlke. You have to open the linked photo to see it, but on the side of the cab just below the road number, the herald on UP 1598 has been defaced. Someone, perhaps a disgruntled former Southern Pacific employee, has painted a circle and slash on the red, white and blue shield, as if saying, "Just say no to UP." 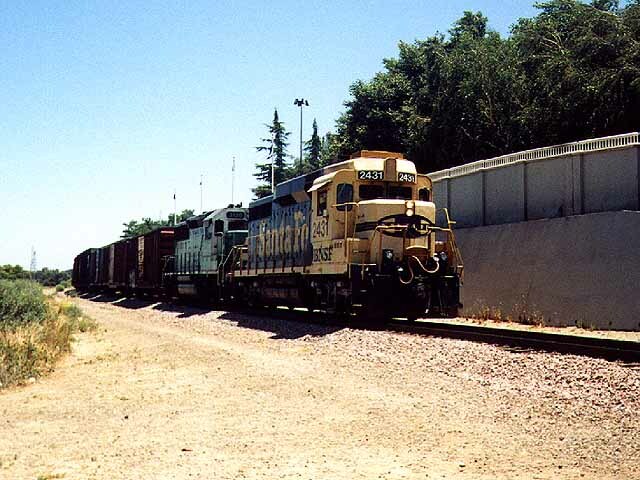 This GP15-1 is the trailing unit on the UP Steel Train pictured in photo #6. We like the way the trees frame the subject. Photo by Roni Gehlke. 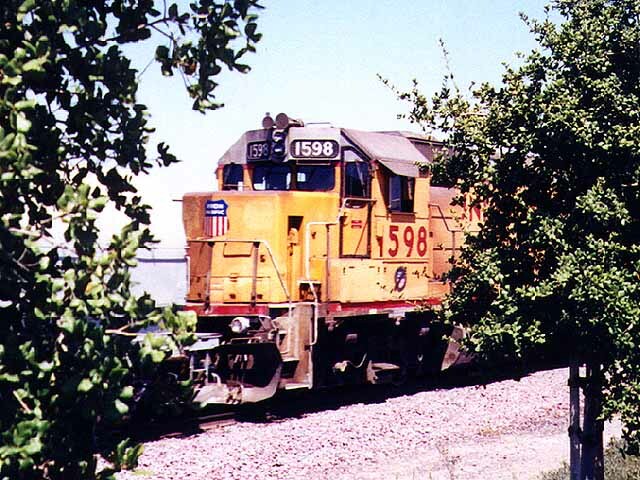 We get an unusual perspective as the eastbound San Joaquin glides out of Antioch's Rivertown district in early April 1999. This shot was taken from the promenade at the end of F Street and that's the Antioch Bridge crossing the Sacramento-San Joaquin River Delta in the distance. The balcony from which this shot was taken sits atop a large retaining wall, visible in picture #1 above. Photo by Roni Gehlke. This page was last updated Thursday, October 21, 1999 at 23:25 hrs.